We are vowed to the riding. But in truth the knights of Christ fight the battles of their Lord with all tranquility of conscience, fearing neither sin by the death of their enemy nor the danger of their own death, because death inflicted or suffered for Christ’s sake bears no trace of crime and often brings the merit of glory... For he bears not the sword without cause; he is the minister of God for the punishment of evil and the exaltation of good. When he kills a malefactor, it is not homicide, but, so to say, “malecide,” and he is clearly considered the avenger of Christ in the case of those who do evil, and defender of Christians. Moreover, when he himself is killed, it is understood that he has arrived in eternal glory... (Migne, Patrologia Latina, vol. 182, col. 924). Heady words, but before we are too easily repelled or self-righteous, let’s remember that both the crusading efforts of the knights and the missionary works of the friars were complimentary. Also, those of us in America are taught to praise as heroes the men, who by force of arms, built and sustained our nation. That included the vanquishing of French and Spanish Catholic culture in Mississippi and the Great Lakes areas, and in the Southwest; the transportation in miserable conditions of thousands of slaves into a life of servitude, the murder and persecution of thousands of Loyalists during the revolution for the heinous crime of supporting the government they and their fathers knew and loved against men who in their eyes were traitors. Dare I mention what our heroes did to the American Indian Nations, those noble people whose love of this land that was literally stolen from their Great Spirit, and their tribes made subject to wholesale slaughter and dishonored treaties. This list can go on. 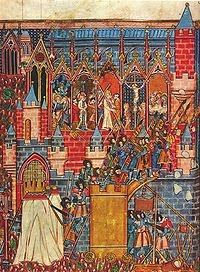 The point I am making is that the medieval knights did what was perceived as right and moral for them in their world. It is not wise to cast stones and neglect the debauchery of society today. I dare say the medieval knights of God would be raising their sword against most of us. In any case, it is important also to see that the medieval knights attempted to pattern themselves after heavenly patrons – Saints of Chivalry. In them they saw not merely prototypes as warriors, but as men. 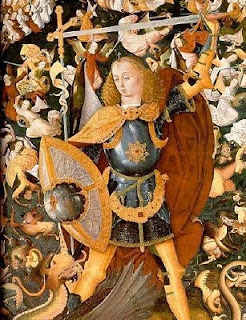 Interestingly, their principle patron was not a man but an angel – Saint Michael the Archangel. In his struggle against Satan at God’s command, when first the cry of revolt was raised in heaven, medieval chivalry saw its first example. “Who is like unto God?” was both St. Michael’s war-cry and name. He was called the Standard-bearer of Heaven and held the honor in Christian postmortem liturgy of leading the souls of the Faithful to Heaven. Most of the mountaintops of Europe were consecrated to him from the Dawn of the Church through the Middle Ages. So too was St. George a patron, not just in England but across Europe. In this soldier, martyred under Diocletian, our fathers found the perfect image of knight and crusader. He also showed us a perfect example of how the best of Eastern and Western Christendom met in reveling the saints and fighting the infidel. As a result of the Crusades, St. George became a sort of patron-general for Chivalry. Many and varied were other patrons of chivalry. “The Seven Defenders of Christendom”: St. George for England, St. Denis for France, St. David for Wales, St. Andrew for Scotland, St. Patrick for Ireland, St. James for Spain, and St. Anthony for Italy. They would often be invoked together under this one head by knights from various countries charging the Saracens. Another list of heroes the knights attempted to emulate were the Nine Worthies. Three were pagans: Hector of Troy, paragon of loyalty; Alexander the Great, who became of demi-Christian hero for his ability to conquer the then known world; and Julius Caesar, founder of the Roman Empire, of which our ancestors believed Christendom to be the continuance of politically. Three of the Worthies were Jews: Joshua, who defeated the Canaanites; King David, who made the Jews mighty and defeated Goliath; and Judas Maccabeus, who led the resistance against the Syrian pagans. Lastly, there were three Christians: King Arthur, Roman leader of Briton’s resistance against the pagans; the Emperor Charlemagne, re-establisher of the Roman Empire. And last was Godefroi of Bouillon, leader of the first Crusade, Liberator of the Holy Land, and considered to be the very flower of Chivalry. Godefroi was at once a courageous warrior and very devout and pious. He founded one of the largest Christian orders of chivalry (of which there were many) – the Knights of the Holy Sepulcher. This order exists to this day. So why would I pick this topic during Advent as many are already celebrating the Christmas season? For the answer, I’ll introduce you to one of the most beautiful ceremonies in the history of the liturgy of the Roman Catholic Church. Until the Postcounciliar (Traditional Roman Catholics separate Church time as Precounciliar and Postcounciliar, according to the time of Vatican II) changes in the liturgy in the 1960’s, the ceremony of the Sword of Christendom was celebrated at 11:00 p.m. on Christmas Eve. The Sovereign Pontiff, the Vicar of Christ, blesses, in His name, a Sword and Helmet, which are to be sent to some Catholic warrior who has served well of the Christian world. In a letter addressed to Queen Mary of England and to Philip, her husband, calling her husband to Rome, Cardinal Pole explains this solemn rite. The sword is sent to some Prince, whom the Vicar of Christ wishes to honor in the Name of Jesus, who is King: for the Angel said to Mary: The Lord will give unto him the Throne of David his father (Lk. 1:32). It is from him alone that the power of the sword comes (Rom. 8:3,4); for God said to Cyrus: I have girded thee with the sword (Is. 45: 1,5); and the Psalmist thus speaks to the Christ of God: Gird thy sword upon thy thigh, O thou most mighty! (Ps. 44:4). And because the sword should not be drawn save in the cause of justice, it is for that reason that a sword is blessed on this Night, in the midst of which rises, born unto us, the divine Sun of Justice. 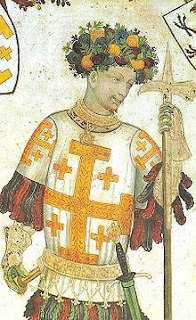 On the helmet which is both the ornament and protection of the head, there is worked in pearls, the Dove, emblem of the Holy Ghost; and this is to teach him who wears it that it is not from passion or ambition that he must use his sword, but solely under the guidance of the divine Spirit, and from a motive of spreading the kingdom of Christ. How beautiful is this union of energy and meekness under the one symbol and ceremony! The power and blending and harmonizing the varied beauty of distinct classes of truth that is to not to be found save in that Christian Rome, which is where God has established the center of Light and Love. The ceremony we have been describing… What a grand list it would be, had we the names of all those glorious Christian warriors, who were thus created Knights of the Church, at this solemn hour, when we would celebrate the birth of Him who came to vanquish our enemy! The prayer used at the imposition of the Sword of Christendom, remained unchanged in the Roman Pontifical until its removal by John XXIII. 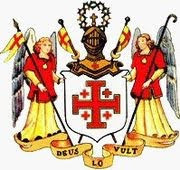 The following prayer was also used by local episcopates when blessing knights for secular rulers within their Episcopal jurisdictions at the imposition of the sword and expresses perfectly the medieval view of knighthood as a vocation. Receive this sword in the name of the Father, and of the Son, and of the Holy Ghost; use it in defense of thyself and of the Holy Church of God, for the confusion of the enemies of the Cross of Christ and of the Christian faith, and never unjustly to the injury of any man, so far as human frailty will permit; which he deign to grant who with the Father and the Holy Ghost liveth and reigneth world without end. Amen. For the medieval knight, the Feast of the Incarnation (Christmas) held special significance. The art of war was not merely a preserve for the nobleman and mercenary, but something which may call to its trumpet all manner of men through knighthood, holy orders and lesser orders as members of the Earthly Church Militant (Church Suffering = Purgatory; Church Rejoicing = Heaven). For the combat of the Christian Knight was not primarily with flesh and blood but with supernatural principalities and powers. The great dragon (the serpent of Eden) lurked in his world (and still does in ours), seeking whom he may devour. The true Christian warrior conformed to the society standards in which he lived that were considered akin to Christ and His Church. I will close with a medieval blessing: May the miracle of the Incarnation reign in your heart and protect you from the dragon. I could really enjoy this stuff, but so many people think that fictional christianity is real, they actually believe in a god that they cannot see! I think christianity has a lot to answere for. But history is very interesting. Thanks for this post. OMGosh! Thanks M/E for having Mary . I am so fascinated by this part of history and shall have to print this out to add to my books on the subject. So sorry I missed the day this was posted. H1N1 did a creep attach and laid me low. Ah Le Loup, what can I do but say with Turtullian, "I believe because it is impossible." I won't preach, but in the end, I think Society will have to answer for how we treat our elderly, mentally ill, and children. We all have our quirks. Julie, I'm so glad you enjoyed the topic. I was trying to find something that was coveted among knights but not generally known by today's readers and writers, but that could also be used in a romance. 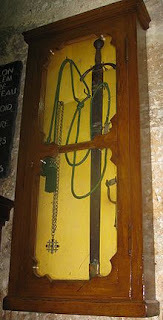 When I ran across Sir Godfrey's (Goifroi) swords at the Cathedral of the Holy Sepulchre, I decided this was it. Take care and happy writing.